But a growing chorus of critics frets about the effects of the low-rate world—a topsy-turvy place where savers are charged a fee, where the yields on a large fraction of rich-world government debt come with a minus sign, and where central banks matter more than markets in deciding how capital is allocated. Politicians have waded in. Donald Trump, the Republican presidential nominee, has accused Janet Yellen, the Fed’s chairman, of keeping rates low for political reasons. Wolfgang Schäuble, Germany’s finance minister, blames the European Central Bank for the rise of Alternative for Germany, a right-wing party. This is a debate on which both sides get a lot wrong. It is too simple to say that central bankers are causing the low-rate world; they are also reacting to it. Real long-term interest rates have been declining for decades, driven by fundamental factors such. Nor have they been reckless. In most of the rich world inflation is below the official target. Indeed, in some ways central banks have not been bold enough. Only now, for example, has the BoJ explicitly pledged to overshoot its 2% inflation target. 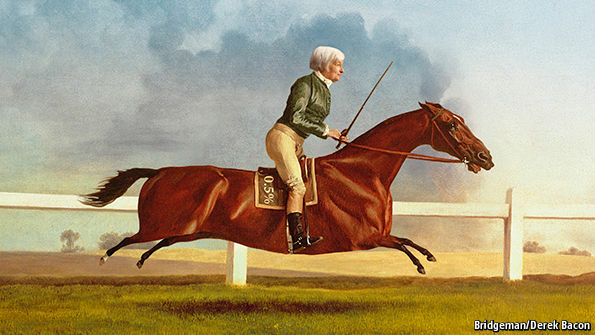 The Fed still seems anxious to push up rates as soon as it can. Yet the evidence is mounting that the distortions caused by the low-rate world are growing even as the gains are diminishing. The pension-plan deficits of companies and local governments have ballooned because it costs more to honour future pension promises when interest rates fall. Banks, which normally make money from the difference between short-term and long-term rates, struggle when rates are flat or negative. That impairs their ability to make loans even to the creditworthy. Unendingly low rates have skewed financial markets, ensuring a big sell-off if rates were suddenly to rise. The longer this goes on, the greater the perils that accumulate. To live safely in a low-rate world, it is time to move beyond a reliance on central banks. Structural reforms to increase underlying growth rates have a vital role. But their effects materialise only slowly and economies need succour now. The most urgent priority is to enlist fiscal policy. The main tool for fighting recessions has to shift from central banks to governments. To anyone who remembers the 1960s and 1970s, that idea will seem both familiar and worrying. Back then governments took it for granted that it was their responsibility to pep up demand. The problem was that politicians were good at cutting taxes and increasing spending to boost the economy, but hopeless at reversing course when such a boost was no longer needed. Fiscal stimulus became synonymous with an ever-bigger state. The task today is to find a form of fiscal policy that can revive the economy in the bad times without entrenching government in the good. That means going beyond the standard response to calls for more public spending: namely, infrastructure investment. To be clear, spending on productive infrastructure is a good thing. Much of the rich world could do with new toll roads, railways and airports, and it will never be cheaper to build them. To manage the risk of white-elephant projects, private-sector partners should be involved from the start. Pension and insurance funds are desperate for long-lasting assets that will generate the steady income they have promised to retirees. Specialist pension funds can advise on a project’s merits, with one eye on eventually buying the assets in question. Politicians will not—and should not—hand over big budget decisions to technocrats. Yet there are ways to make fiscal policy less politicised and more responsive. Independent fiscal councils, like Britain’s Office for Budget Responsibility, can help depoliticise public-spending decisions, but they do nothing to speed up fiscal action. For that, more automaticity is needed, binding some spending to changes in the economic cycle. The duration and generosity of unemployment benefits could be linked to the overall joblessness rate in the economy, for example. Sales taxes, income-tax deductions or tax-free allowances on saving could similarly vary in line with the state of the economy, using the unemployment rate as the lodestar. All this may seem unlikely to happen. Central banks have had to take on so much responsibility since the financial crisis because politicians have so far failed to shoulder theirs. But each new twist on ultra-loose monetary policy has less power and more drawbacks. When the next downturn comes, this kind of fiscal ammunition will be desperately needed. Only a small share of public spending needs to be affected for fiscal policy to be an effective recession-fighting weapon. Rather than blaming central bankers for the low-rate world, it is time for governments to help them. It is not a surprise that Russian regions have debt – but since Russia has entered its second economic recession in less than 10 years, social problems have increased. While the regions are expected to administer their budgets independently, the federal government usually comes to their rescue, bailing them out. But the government has seen revenues decline since the drop in oil prices, considering that more than 50 percent of budget revenues come from oil exports. Russia may exhaust one of its reserve funds next year, due to declining oil revenue. Earlier this month, the Russian Ministry of Economic Development released its economic forecast for the next three years, showing anemic growth rates – under 3 percent – for both scenarios it considered. The other key factor that will determine growth is the inflation rate, which will affect ordinary Russians. Numbers are great for writing reports, but to the average Russian citizen, purchasing power is what really matters. Russia’s Federal State Statistics Service announced that disposable income fell in August by 9.3 percent in annual terms, the steepest decline since August 2009, just after the global financial crisis. This news accompanies reports on the rising number of Russians who are growing their own food to supplement their food supply. Some Russians have started volunteer food-sharing programs to collect food from restaurants and distribute it to those in need as the number of struggling families grows. While such reports may sound alarmist, famine and limited food supply have been issues for Russia historically. Due to the country’s climate, only 13 percent of the land is suitable for agricultural use. The transportation network in the country doesn’t allow farmers to efficiently send their products to urban areas. Moreover, the country’s development model for more than half of century has been based on industrialization that depended on natural resource exploitation. 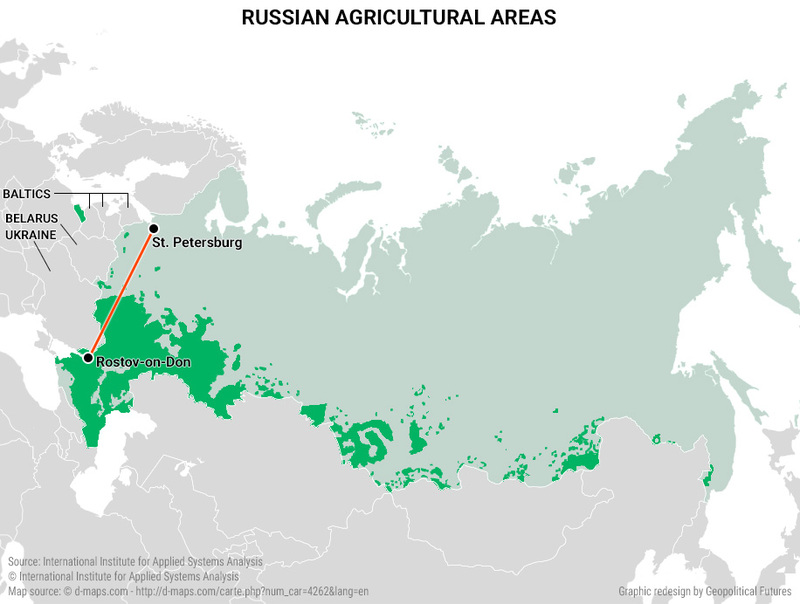 However, in Russia, areas rich in natural resources also have higher population density than the rest of the country and are highly vulnerable to fluctuations in the economy and commodity prices. In April, the World Bank said that an estimated 3.1 million Russians have slipped below the poverty line and the increase in poverty will continue. The struggling economy therefore threatens to weaken social stability in the country. The latest poll released by Russian research group the Levada Center indicates that 34 percent of the population believes the government is not providing citizens with adequate social security. Taking into account the potential for increased instability in the country due to the dire economic conditions, the Kremlin started looking at potential economic reform programs early this year. But, as parliamentary elections took place on Sept. 19, no announcements have been made yet. However, there were hints that a new taxation system will be implemented and that pensions may be indexed to the level of inflation again. After President Vladimir Putin’s party, United Russia, won a landslide victory in the election, the president addressed the country’s economic woes in his victory speech, pointing to reforms that need to be carried out. Amendments to the budget proposals for 2016-2019 will be discussed at a government meeting on Oct. 13. Privatization of oil producers Rosneft and Bashneft has been discussed as a way to raise much-needed cash for the government’s budget, though both companies face the challenge of finding a willing buyer at the desired price. Discussions on defense expenditure cuts have gone on for months now. It is therefore likely that unpopular decisions will be made in the coming months as the Kremlin needs to address the economic situation sooner than later, with presidential elections coming up in 2018. At the same time, Moscow will maneuver carefully to ensure it does not increase instability. Protests have been taking place in the regions since earlier this year. These have included riots in the city of Smolensk in April, as residents were unhappy with the rise in utilities costs, and a convoy of tractors and cars from Kuban that drove into Moscow in August. Observing the rising danger of regional unrest, Putin has been building up the security apparatus to increase control throughout the country. Since January, we have seen reshuffles at top levels of law enforcement and security sectors, which have resulted in a renewed, younger guard of Putin’s loyalists placed in key positions. At the same time, Putin announced in April the formation of the new National Guard, through which he has direct control over two essential processes: getting intelligence on potential unrest in the regions and ending any protests. In addition, Russia’s Kommersant newspaper reported on Sept. 20 that Russia will resurrect the Ministry of State Security, combining the Federal Security Service with the Foreign Intelligence Service and the majority of the Federal Protection Service units, which oversee the protection of the country's top leaders. The ministry will start operating before the presidential elections in 2018 and will reportedly be engaged in the highest profile cases, one of its functions being to root out corruption in law enforcement agencies. Corruption is both an electoral campaign issue for Putin and a phenomenon that has undoubtedly negatively affected the structural development of the country. The fight against corruption led by the Kremlin will have political functions as well, considering the Kremlin’s need to keep tight control over the country. Russia is facing troubling times – all pointing to our forecast that Russia will face a major crisis by 2020. With a declining economy and limited options to address rising social problems, vulnerabilities for Putin will increase. The fundamentals of Russian geopolitics indicate that he must keep Russia united. He sees controlling security structures as key for keeping the country unified and under his rule. At the same time, as his power and the economy weaken, unpredictability will rise for Russia, especially in key strategic borderland regions like Ukraine, the Caucasus and the Black Sea. A Concluding Statement describes the preliminary findings of IMF staff at the end of an official staff visit (or ‘mission’), in most cases to a member country. This mission was undertaken as part of regular consultations under Article IV of the IMF's Articles of Agreement. The views expressed in this statement are those of the IMF staff and do not necessarily represent the views of the IMF’s Executive Board. Based on the preliminary findings of this mission, staff will prepare a report that, subject to management approval, will be presented to the IMF Executive Board for discussion and decision. The authorities have consented to the publication of this statement. 1. Brazil’s deep recession has many roots. Policymaking in recent years has failed to tackle long-standing structural problems and proven to be counterproductive, contributing to the erosion of policy credibility and a large contraction of output. The recession has been made worse by several other factors, including declining terms of trade, tight financing conditions, necessary but steep increases in electricity tariffs, a corruption scandal, and a political crisis, which has underpinned heightened uncertainty. The recession has taken a massive toll on employment and progress on reducing social inequalities has slowed. Despite a large output gap, inflation has exceeded the top end of the target band since 2015, as disinflation has proceeded slowly. 2. Fiscal sustainability is at risk . The end of an era of above-average growth, based on a consumption boom and high commodity prices, has exposed structural fiscal fault lines. The fiscal position, including at the subnational level, has reached its worst level in over two decades, reflecting the impact of the recession on top of adverse structural factors. The decline in potential growth and persistently high real interest rates have contributed to a significant worsening of the debt dynamics. 4. Growth should resume gradually in 2017. There are tentative signs that the recession is nearing its end. Staff project output growth of -3.3 percent in 2016 and about ½ percent in 2017. The projection is predicated on the assumption the fiscal spending cap and social security reform are approved in a reasonable timeframe, and the government will meet the proposed fiscal targets for 2016 and 2017. With these improvements on the fiscal front, and assuming uncertainty continues to decline, investment is projected to continue to recover, supporting a gradual return to positive sequential growth beginning in late 2016. A more rapid recovery in economic activity is hampered by excess corporate leverage, high unemployment, and weak balance sheets of households. Inflation is expected to gradually converge toward the midpoint of the target band. 5. 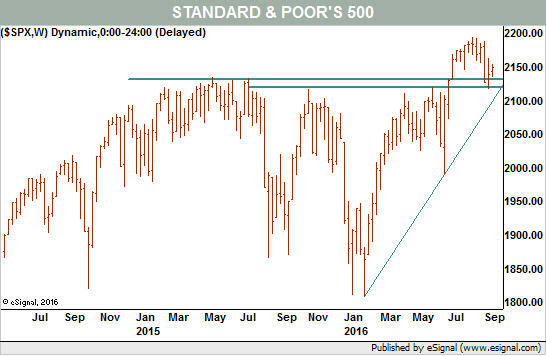 Downside risks continue to dominate the outlook, but some upside risks are emerging. The key domestic risk is that the government fails to deliver on the core of its fiscal consolidation strategy. Policy implementation challenges include navigating reforms through Congress in a tight time frame. If key reforms are watered down or get stalled in Congress, the boost to confidence will be short lived, and the recession may continue, putting further stress on income and balance sheets throughout the economy. In a similar vein, a re-intensification of political uncertainties will be a drag on growth. External risks relate to a more protracted period of slow growth in advanced and emerging economies, especially China, further declines in commodity prices, and tighter external financial conditions. But some upside risks have also emerged. Recent policy pronouncements have boosted confidence and asset prices. If this gathers further momentum, for example, because of a faster-than-expected approval of the spending cap and social security reform, it could facilitate a reduction in risk premia, triggering a more vigorous turnaround in investment (including as a result of M&A activity) and growth. 6. The government’s focus on controlling the growth of fiscal spending is an imperative and is welcome. Unsustainable fiscal policies, driven by unfunded and increasingly onerous mandates on the expenditure side, ultimately increase borrowing costs for all agents in the economy and slow down economic growth, contributing, in turn, to a further worsening of the public debt dynamics. The approval and steadfast implementation of the spending cap could be a game changer—it would help improve the long-term trajectory of public spending and permit the stabilization and eventual reduction of public debt as a share of GDP. Social security. It is important to move expeditiously on social security reform. The reform needs to be broad based, focusing on all of the main aspects of the system, including a modification of the rules governing retirement age, replacement rates at retirement, access to other benefits, duplication of benefits, and those affecting the annual growth of payments to beneficiaries. In the interest of fiscal prudence, as well as equity and fairness, the reform should also encompass the regimes for public sector employees at all levels of government. Given still high inequality and to mitigate the impact on the poor, a reform package should include provisions aimed at protecting the most vulnerable. Subnational governments. The upward trajectory of expenditures in many states, including some of the largest, needs to be contained through the adoption of a rule similar to the one proposed for the federal government. Enacting legislation enabling states to make difficult expenditure adjustments should be part of the strategy to help states regain control of their finances. A firm commitment by states to reform their finances and increase transparency in the reporting of expenditure is key. Fiscal framework. Strengthening the medium-term fiscal framework, reducing budgetary rigidities (including of tax earmarking), and increasing the flexibility of the composition of spending would increase the effectiveness and credibility of the spending cap. To increase transparency and the management of fiscal risks, it is recommended to consolidate Petrobras and Eletrobras into non-financial public sector statistics (without including them in the calculation of the fiscal targets). Minimum wage and indexation. The formula for minimum wage revisions affects the growth of pensions and other benefits, and is therefore a major source of fiscal pressure over the medium term. The link between social benefits and the minimum wage merits revision, while the minimum wage formula should be revised to better reflect improvements in productivity. Spending efficiency. The spending cap will make it imperative for government agencies to make better use of resources to prevent a decline in the quality of their services. 8. Fiscal consolidation based solely on the spending cap would take several years to stabilize public debt, and carries attendant risks . In such a scenario, public sector debt as a ratio of GDP will still continue to grow for a number of years, before peaking and beginning to decline gradually. The overall deficit would also remain high for an extended period, during which the government would continue to crowd out private agents from scarce funding. 9. Thus, there is merit in a more frontloaded consolidation. 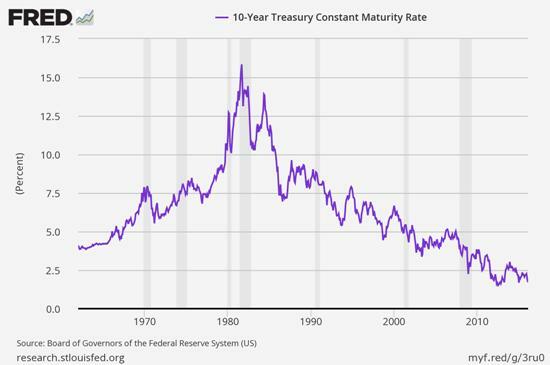 The exact moment when debt peaks will be affected by the rate of growth of the economy and real interest rates in coming years, and also by the trajectory of primary balances, over which the government has more control. A possible objective could be to reach a primary balance of around 3½ percent of GDP over the next 5 years, which would stabilize debt by 2021. A combination of expenditure and revenue measures could be considered to this end. Given concerns over the short run impact on output of faster consolidation, these measures could be designed to come into effect once economic growth has firmed up. 10. Monetary policy should remain tight until inflation expectations converge more clearly toward the center of the target band. Staff considers current monetary policy settings as broadly appropriate given inflation expectations. Tangible progress on restoring the sustainability of public finances would allow more room for monetary easing to support the recovery. 11. The exchange rate should remain the first line of defense against shocks. Intervention in foreign exchange markets should remain limited to episodes of clear market disruption and high volatility, and reserve buffers should be preserved. Under the baseline, staff sees merit in the continuation of the central bank’s policy of reducing the net notional value of FX swaps. The use of reverse FX swaps is also a good tool for this purpose, supplementing the reduction in rollover rates of FX swaps. 12. The resilience and efficiency of the banking sector should be bolstered. The health of the banking system remains largely sound, although the recession has affected profitability and asset quality. The mission welcomes the moderation in the growth rate of credit by public banks, their plans to reduce direct financing of large corporations with market access, and the intention of the two largest public banks to strengthen their capital position. To make the banking sector more resilient to shocks, financial safety nets should be improved by strengthening the procedures for use of the deposit insurance fund, enhancing the central bank’s emergency liquidity assistance, and modernizing the resolution regime. Frameworks to identify, prepare for, and respond to future risks, involving all financial regulators, should be put in place expeditiously. The authorities are also urged to follow through on their plans to strengthen private insolvency frameworks, with the aim of expediting the bankruptcy process and reducing default losses incurred by banks. Infrastructure bottlenecks. Following through on recently announced enhancements and regulatory reforms would help make the concessions program more attractive to investors, while maintaining high standards of governance and program design. Opening of the economy . Reductions in tariffs and nontariff barriers, including a revision of the policy on domestic content requirements, and pursuing free-trade negotiations outside Mercosur, would help boost competition, efficiency, and growth over the medium term. Efficient allocation of savings . A review of credit earmarking rules and other distortions would be advisable to ensure that national savings go to their most productive uses. Labor reform . Reforms aimed at facilitating productive employment and reducing incentives for informality would promote job-creation, investment, and growth. Tax reform . One important way to reduce the cost of doing business would be to simplify the State Tax on the Circulation of Goods and Services (ICMS). PIS/CONFIS and IPI should also be consolidated and replaced with a true federal VAT. 14. The effective implementation of transparency, anti-corruption and anti-monetary laundering measures would contribute to enhancing predictability for businesses and ensuring a greater perception of fairness. The government’s commitment to make data on public procurement open by default, implement the recent legislation on conflict of interest, and strengthen whistleblowing mechanisms will go a long way towards increasing transparency. The mission is grateful to the authorities and other counterparts for excellent discussions and their hospitality. Technical ratios within the market weakened ahead of the Sept. 9 selloff, but they came roaring back in the past two weeks. Now we know that the Federal Reserve has declined to raise interest rates. What we don’t yet know is that decision’s lasting effect on the stock market. Last week I wrote that the Sept. 9 selloff, sparked by hawkish comments from the Fed, created an important technical breakdown. Certain technical ratios that give us a read on the market’s mood and risk aversion weakened ahead of the Sept. 9 decline, but in the days that followed, they actually turned more bullish. The one thing we know about the market is that it always throws curveballs. But we can use this information to set up the environment in which the Fed’s lack of action will manifest. 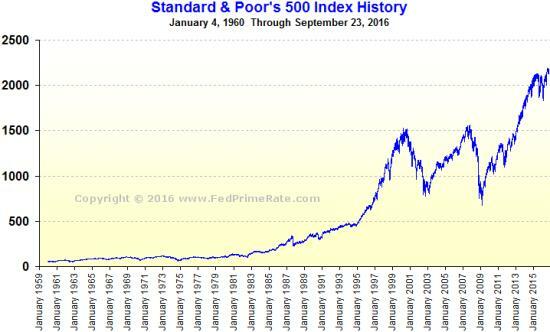 Let’s start with the Standard & Poor’s 500 index. After the Sept. 9 downturn, it traded down to touch the top of its former — and huge — two-year trading range (see Chart 1). Bears talk about the breakdown from its smaller two-month range and a drop below its 50-day moving average. Bulls see a test of the long-term breakout and last chance to buy before the next leg higher. The question now is all about what happens at that test, which is the zone between 2130 and 2135. (The S&P 500 traded at 2146 Wednesday morning.) With the Fed’s decision to hold rates where they are, we should see if that very important support level holds once the volatility from the initial knee-jerk reaction fades. Now let’s look at the ratios. Just ahead of the Fed Wednesday, the small-capitalization Russell 2000 index was still outperforming the S&P 500 in 2016. And despite the significant bearish reversal seen in the Sept. 9 decline, it bounced off a long-term support level that goes back to 2014 (see Chart 2). As with the S&P 500, whether this support holds is critical, because a breakdown would likely move the performance ratio chart to the downside as well. The market usually has a tougher road when small stocks are left behind. 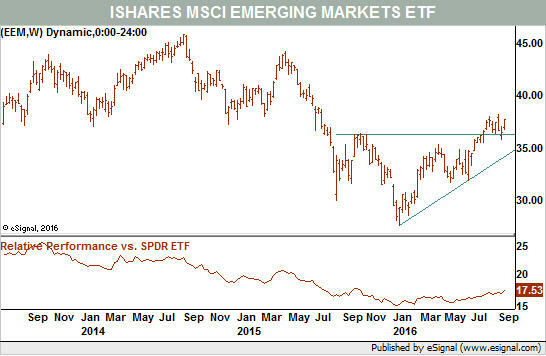 The next ratio is emerging markets versus the U.S. market. A chart of the iShares MSCI Emerging Markets exchange-traded fund EEM EEM in Your Value Your Change Short position (ticker: EEM) versus the SPDR S&P 500 ETF Trust Y in Your Value Your Change Short position (SPY) showed a fledgling breakdown a few weeks ago, but it has since reestablished its rising trend (see Chart 3). I wrote that the breakdown was bearish, and that is clearly no longer the case now. 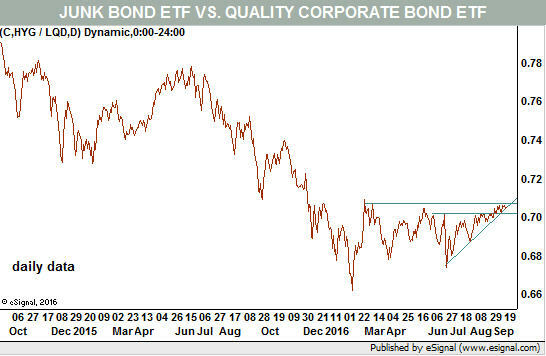 And finally, we have the ratio of risky corporate bonds to investment-grade corporate bonds. When the market feels feisty, it is more willing to buy higher-yielding junk bonds, and the ratio rises. The chart of the iShares iBoxx $ High Yield Corporate Bond ETF HYG in Your Value Your Change Short position (HYG) to the iShares iBoxx $ Investment Grade Corporate Bond ETFLQD in Your Value Your Change Short position (LQD) stalled last month (see Chart 4). I wrote that it was looking for direction, but in the days that followed it edged slightly higher. Unfortunately, it is at a new resistance level, and while arguably stronger than it was, it is still on hold as an indicator and not giving us any signals. As fixed-income instruments, these bond ETFs could really feel the effects of the Fed decision. We will know that by the ratio either breaking out or abruptly sinking. 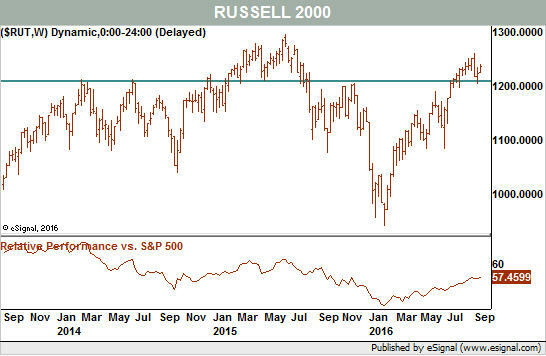 Sideways movement will just be more of the same in terms of the market’s attitude toward risk. Pulling it all together, the lows seen after the Sept. 9 decline in all markets — the S&P 500, the Russell 2000, emerging markets, and even junk bonds — are critical. If these supports do not hold, then the ratios of the riskier markets to the safer markets will likely break down as well, and that would lead to a rough ride into the election. MADRID – Since the eurozone crisis began in 2008, the European Union has, from a political perspective, led an intergovernmental life in supranational clothing. But as the EU prepares to negotiate Britain’s exit, it is becoming increasingly apparent that the Union no longer has any clothes at all. The question now is whether the EU’s status as an enterprise dominated by its member states is permanent. The supremacy of member states – especially Germany – in EU decision-making is far from new. It was evident throughout the euro crisis, when German Chancellor Angela Merkel and her finance minister, Wolfgang Schäuble, along with the European Council’s then-president, Belgium’s Herman Van Rompuy, took center stage. Instead, that battle has been playing out largely within the European Council, with Merkel assuming a central role. While it is impossible to say exactly what the EU that emerges will look like, it seems clear that it will look nothing like the Brussels-centric, deeply integrated Shangri-La long sought by many at the Commission. Merkel, for her part, spent the summer preparing a member-state-led approach to the Brexit negotiations and Europe’s future. The discussion and outcome of the Bratislava summit underscored these efforts. As for the Commission, its only real action in recent months was to appoint Michel Barnier in July as its chief representative in the Brexit negotiations. With the Council taking command of that process, it is far from clear what Barnier will actually do. In fact, with member states’ domestic politics playing a more important role than the European Council in driving whatever EU policy momentum exists, even an intergovernmental EU may be too much to hope for. Consider Germany, where the dreadful performance of Merkel’s Christian Democrats in a string of regional elections, including in her home state of Mecklenberg-West Pomerania, has caused many to question the country’s trajectory. Now, the wait is on for next year’s federal election, which may send the country – and its approach to EU leadership – in a very different direction. Uncertainty is also coming from other directions: Italy will hold a constitutional referendum by the end of this year, and France and the Netherlands will hold elections next year. None of this is to say that supranationalism is a thing of the past. But it is likely that parochial interests will become even more dominant, at least until major elections are complete. An opening for a European approach may follow, but only if the current torpor does not lead to institutional atrophy. Earning the public’s trust is crucial. In the past, the EU has forged ahead, as if the public approved. It does not. As Hubert Vedrine, a former French foreign minister, recently estimated that only 15-20% of Europeans are Europhiles, another 15-20% oppose the EU outright, and the remaining 60% are “euro-allergic.” It is a rough but fair portrait. Put simply, for much of the public, EU institutions lack legitimacy. The reasons are well known: poor communication, a democratic deficit, finger pointing between member states and the Commission, a flawed institutional architecture. Juncker and Martin Schulz, the president of the European Parliament, can speak about méthode communautaire until they are blue in the face; it is not happening in the foreseeable future. The result is clear: in the struggle over how Europe will develop, the EU institutions lack the authority or support to put up much of a fight – or even fully enter the ring. But this moment of national navel-gazing among the member states may actually present an important opportunity for EU institutions to work on closing the legitimacy gap. This means resisting the urge to wax poetic about future actions that never actually materialize, or to roll out impressive-looking programs with few real-world effects. It means, instead, completing key initiatives, most urgently the banking union; improving accountability; and ensuring that the public understands what the EU institutions are doing. And it means staying out of political conflicts, which neither the European Commission nor the European Parliament are in any position to win. If this approach seems cautious, that is because it is. Now is the time not for risky shortcuts, but for meticulous, well-planned, incremental measures that gradually and consistently earn the public’s trust. The relatively modest list of concrete priorities issued by Juncker and Commission First Vice-President Frans Timmermans is a good start. Most people are not stupid. They can generally tell when they are being strung along, and they are tired of empty rhetoric and half-baked initiatives. Only if the EU institutions deliver genuine action, in a credible and transparent manner, can they ensure that the current inter-governmentalism is just a phase and that the future of Europe is Europe. It’s Not Just Deutsche Bank. The Whole Financial Sector Is Dying These are great times for financial assets — and by implication for finance companies that make and sell them, right? Alas, no. Just the opposite. Each part of the FIRE (finance, insurance, real estate) economy is imploding as “modern” finance hits the wall. 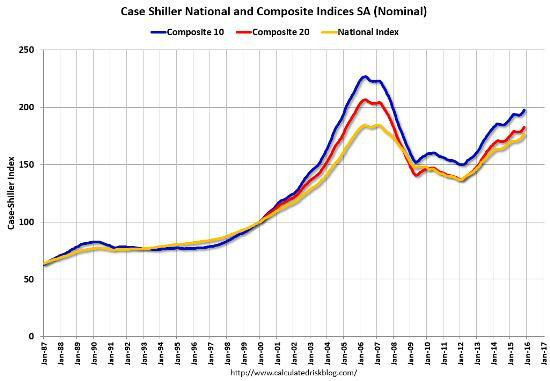 And real estate is revisiting its recent bubble. (Telegraph) – Commerzbank, the second-biggest bank in Germany, has suspended its dividend and revealed more than 9,000 job losses as it tries to shore up its business in the face of ultra-low interest rates and sagging client activity. Commerzbank also warned that “ongoing weakness in the shipping markets” would push up its loan loss provisions in the coming months. The bank decided four years ago to exit the ship financing business but still has about €8bn on its books. The bank will cease dividend payments “for the time being”, prompting analysts at RBC Capital Markets to scrap their forecasts for payments until at least 2018. (Bloomberg) – ING Groep NV, the largest Netherlands lender, will announce thousands of job cuts at its investor day on Monday, Dutch newspaper Het Financieele Dagblad reported Friday, citing unidentified people with knowledge of the matter. The reorganization will result in more central management and may generate billions of euros in savings, the paper said. Raymond Vermeulen, a spokesman for the Amsterdam-based bank, declined to comment on the report. The bank employs about 52,000 people, according to its website. (Boston Globe) – The Stanford University endowment posted a 0.4 percent loss on its investments for fiscal 2016, underperforming some large rivals but doing better than Harvard University’s 2.0 percent loss. The median return for foundations and endowments tracked by the Wilshire Trust Universe Comparison Service was negative 0.3 percent. Harvard is the largest university endowment, with $35.7 billion in assets. Harvard president Drew Faust said the “disappointing” investment return would “constrain our budgets,’’ according to the Harvard Crimson. Harvard Management Co. is seeking a new chief executive after the departure this summer of Stephen Blyth after a short, year-and-a-half stint. The endowment manager is under pressure to boost performance; Blyth had said it needed to produce at least a 5 percent return annually to meet its obligations to Harvard’s annual operating Budget. (Bloomberg) – The $1.9 trillion shortfall in U.S. state and local pension funds is poised to grow as near record-low bond yields and global stock-market turmoil reduce investment gains, increasing pressure on governments to put more money into the retirement systems. With the Federal Reserve deciding to hold interest rates steady at its meeting Wednesday, the funds will continue to be squeezed by rock-bottom payouts on fixed-income securities just as stocks fall overseas and post only modest U.S. gains. If every part of the financial sector hits the wall simultaneously, the resulting crisis will overwhelm the ability of governments and central banks to keep the game going. Their last, desperate policy experiment will involve coordinated currency devaluations to make debts less onerous. When this fails because everyone responds by borrowing even more — thus making the total debt burden more rather than less onerous – most of what remains of the FIRE economy will die a noisy death. This will be a disaster if you work on Wall Street, rely on a public sector pension and/or own a bunch of bank stocks. It will be hard but survivable if your wealth is in real rather than financial assets. Gold, as always, is the safe haven.